Enter at the Big Stump entrance on highway 180, stop at the Kings Canyon Visitor Center to get oriented. 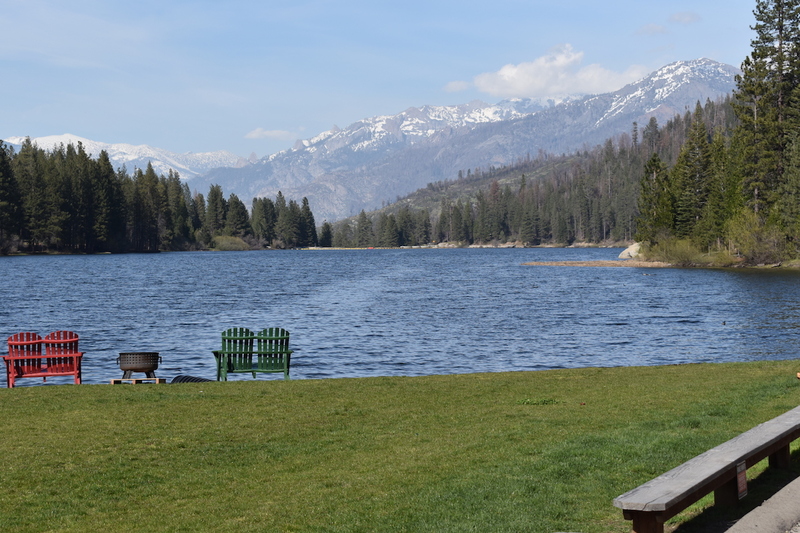 Drive directly to Zumwalt Meadow and the end of Kings Canyon Scenic Byway. Admire the views along the way. Hike the 1.5 mile Zumwalt Meadow loop. Trail head is 4.5 miles east of Cedar Grove Village. Hike the short trail of Roaring River Falls. Trail head is 3 miles east of Cedar Grove Village. Stop at Cedar Grove Village and take in the roaring river. Good spot for picnic. Drive to Grant Grove. Walk the 1/3 mile Grant Tree trail and the 1.5 mile North Grove Loop. 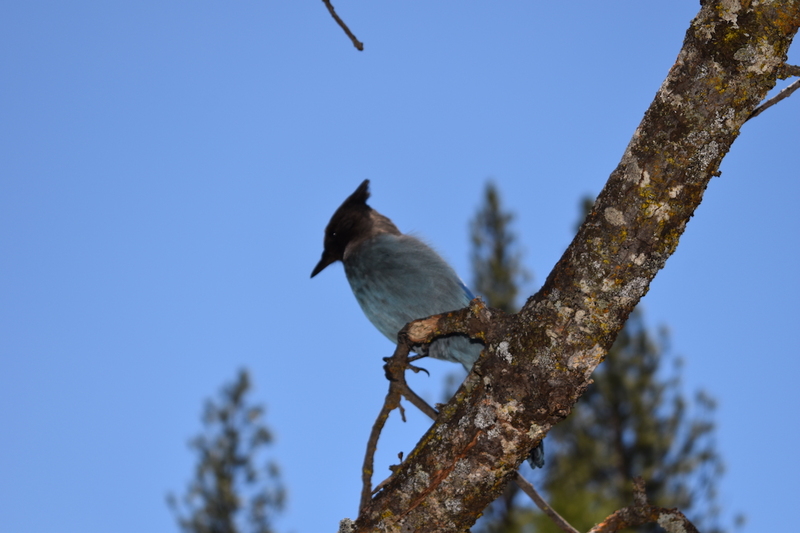 Before our visit to Kings Canyon National Park, we didn’t know what to expect. What we found was a hidden gem that was very enjoyable to visit, with beautiful canyon scenery, and solitude. 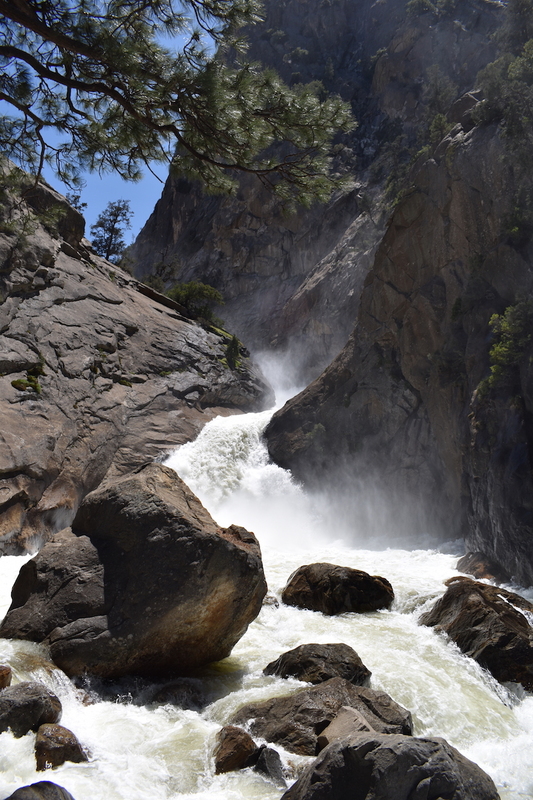 Kings Canyon National Park is a smaller, less crowded version of Yosemite. We stopped at the Kings Canyon Visitor Center and followed the ranger’s advice to go all the way to the end of Kings Canyon Scenic Byway and work our way back from there. 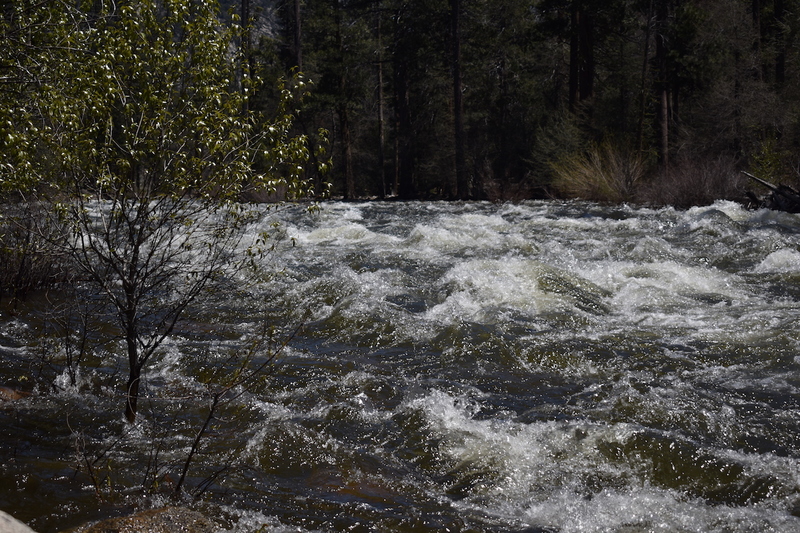 The road opened for the season just a few days before our visit on May 2nd, and the snow melt from the winter had the South Fork of Kings River roaring. There were few people as we drove into the canyon. The road climbed a bit from Grant Grove, elevation 6589 feet, before it descended steeply to meet the river. 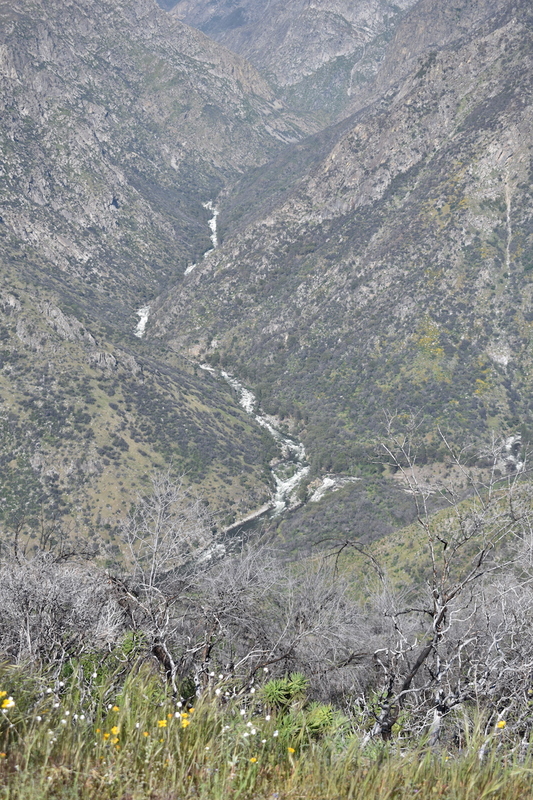 The initial view of the canyon from above was sweeping, with snow capped peak in front, and the ribbon of river winding through the curves below. The road descended down 2000 feet through switchbacks, with cliff on one side and sheer drop off on the other. After the descent, it hugged the river with cliffs on both sides 4000 feet above the river. 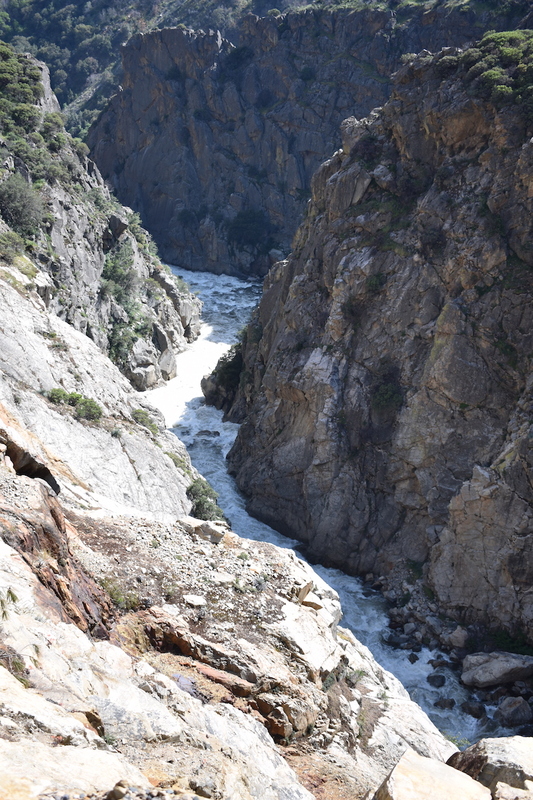 Spring snow melt gave Kings River an extra jolt of energy as the water rushed down the mountain, carving an ever deeper canyon. The roar of the river was a constant backdrop as the canyon got narrower as we approached the end of the road. The crystal clear water called me to dip my foot into the water, but I heeded the warning and respected the power of nature. The current was swift and powerful. Two people died in the week we were there, swept away by the strong current of the mighty Kings River when they fell in accidentally. I wasn’t about to be reckless. 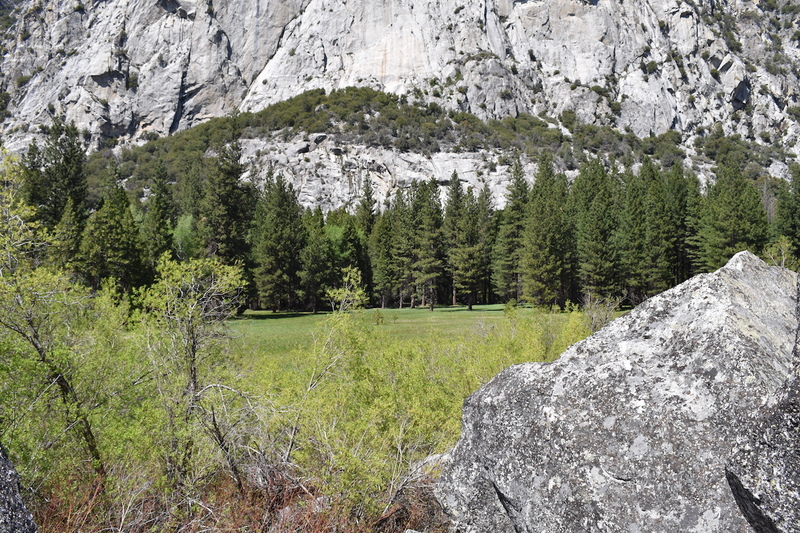 Like Yosemite, the cliffs are made of granite and we got a closer look with a hike at Zumwalt Meadow. The trail took us across Kings River into a forest of tall trees before it opened up into a meadow with large granite boulders on the side of the meadow. The trail weaved in and out of the boulders with deep crevasses between the boulders. The valley at the canyon floor is much narrower than Yosemite and the river flowed faster. King’s Canyon is one of the deepest canyon in the world with maximum depth of 8200 feet, far exceeding Yosemite and even the Grand Canyon. The narrowness of the canyon and the depth gave me a claustrophobic feel looking up from the bottom. A short walk up a moderately steep, paved, trail led us to Roaring River Falls. While not the tallest, it was very pretty and we saw the power of the rushing water. The fall was so loud, we had to shout to have a conversation. Loretta shouted nervously for me to be careful as I inched closer to the edge for a better angle for my photo. Any slip would be the end of me. We stopped by Cedar Grove Visitor Center, which was closed because it was too early in the season. There was a large campground I’m sure would be busy during the peak season. On this day, however, we had the place to ourselves. We sat on a couple of lounge chairs by Kings River, mesmerized by the swollen river, as a small flock of birds joined us, cautiously looking for food. We ate our picnic Subway sandwich lunch as we soaked in the scenery and the perfect atmosphere with river front view and the soundtrack of the roaring rapids. The temperature was a perfect 65 degrees with clear blue sky. We sat in the shade with a gentle breeze and birds chirping and hopping from tree to tree. We were alone for the entire time, sitting comfortably on a chase with our feet propped up. This was the ultimate relaxation! We arrived at General Grant Grove in late afternoon to view the second largest tree. The trail was in the shade, with heavy canopy from the giant trees. As we walked toward General Grant tree, my face was hit with small bugs. I was walking through a large cloud of tiny bugs! Insects buzzed my ears. This was not pleasant! Never fear! We came prepared. The day before, we walked through Sherman tree, also in heavy shade and encountered a smaller version of the same bug problem. We went to REI and bought bug nets to solve exactly this problem. We went back to the car, put on our bug nets, and confidently walked the trail with impunity while others were busy swatting the bugs from their faces. I looked for an chance to try out the bug nets and this was the perfect opportunity! The bug nets worked wonderfully. I didn’t get a single bite and I did not feel bugs at all, although the net did make everything darker. I hate bugs so this was a good trade-off. 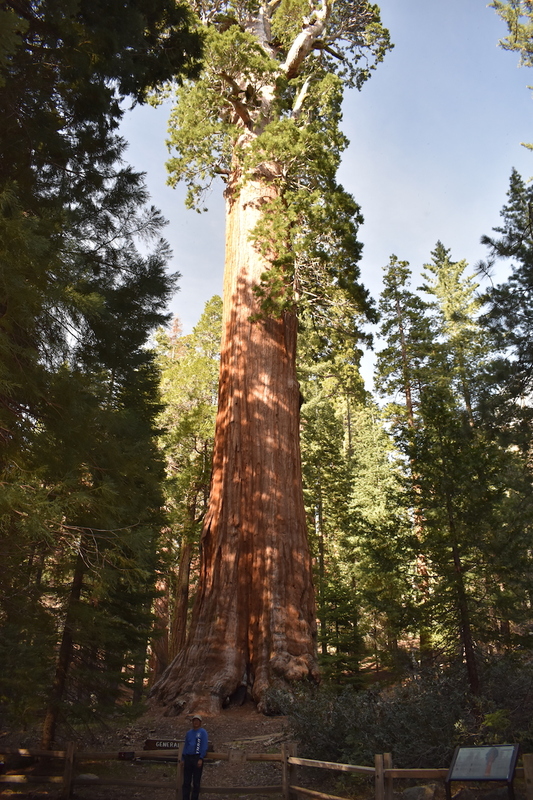 Since General Grant tree is “only” the second largest, it received less crowds than General Sherman tree. Everyone wants to see the largest tree but you can’t really tell the difference. It’s only eight feet shorter and I doubt anyone can tell the difference from the ground. The trail led to other tall trees named after people like Lincoln. This area is similar to General Sherman tree area in Sequoia National Park. We decided to take an alternate route as we headed towards General Grant area from Kings Canyon through Hume Lake. This was a very pleasant surprise. Hume Lake is technically in Sequoia National Forest, with a retreat center used by Christian youths. The lake was beautiful, and extremely picturesque. The workers were getting the place ready for the season, but even among the bustle, the placid lake in the afternoon sun was just as you would see in a postcard. I can easily see lots of kids and family having a good time on the lake during their retreat in the summer time. 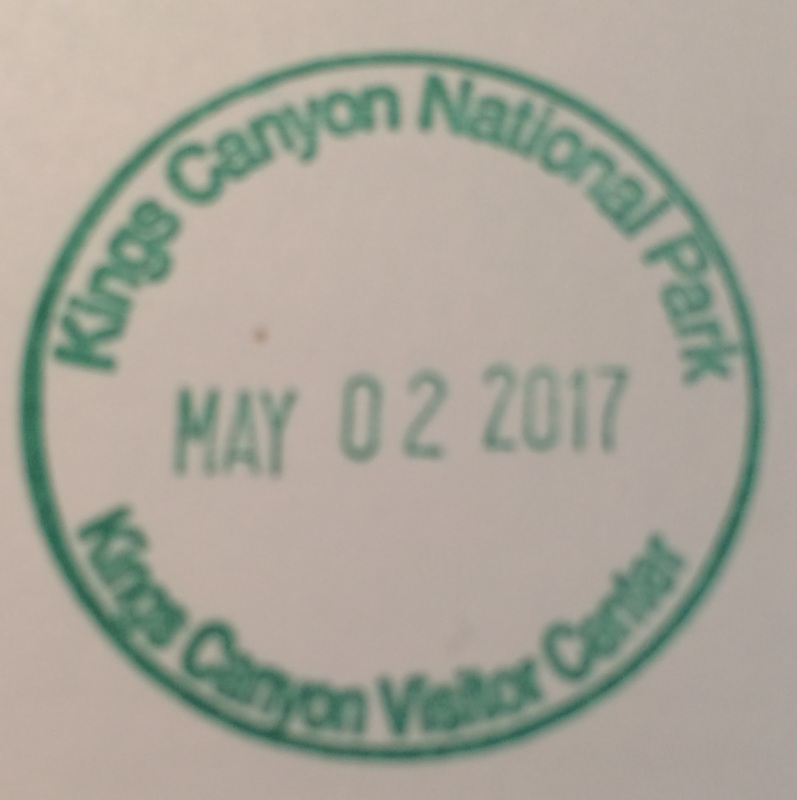 While Kings Canyon and Sequoia are two different national parks right next to each other, they are administered as one. Generals Highway that connects General Sherman tree with General Grant tree (thus the name of the highway) technically leaves Sequoia National Park, into Sequoia National Forest, before it enters Kings Canyon National Park. From General Grant area, the King Canyon Scenic Byway leaves Kings Canyon National Park into Sequoia National Forest before it reenters the national park. All of this is to say the jurisdiction is complex and can be confusing if you are a stickler for boundaries. Practically, it doesn’t affect the visitors. The distinction between national park and national forest is in land use. Things that are prohibited in a national park such as hunting and logging are often permitted in a national forest. What you see here is a compromise between the economic interests and the preservation interests. I found it strange General Grant area is part of Kings Canyon, not Sequoia. Large trees is the calling card for Sequoia while deep canyons is the calling card for Kings Canyon. Why not re-draw the boundaries and let General Grant area be part of Sequoia? Keep the focus for giant trees in one park, and focus on the canyon for the other. That made more sense to me. If the parks are administered together, why not just make them all one park instead of two? There must be reasons but I’m not convinced the reasons are logical. Kings Canyon was a very enjoyable park to visit. The scenery was intimate and imposing at the same time. It felt like a combination of Black Canyon and Yosemite. It’s similar to Black Canyon because of its narrowness and depth, but with a view from the bottom up instead of tops down. It’s similar to Yosemite because of its granite composition and the view from the bottom. What made this park enjoyable? The scenery was nearly as good as Yosemite but without the terrible crowds. While the vistas are not as sweeping, the narrowness gave a more intimate sense of the canyon. The Grant Tree grove is larger and more imposing than Mariposa Grove in Yosemite, which boasts the fifth largest giant sequoia. Kings Canyon is a hidden gem, well worth the visit. Have you visited Kings Canyon? Leave a comment below on your experience. Click on the Follow link and get an email when new postings are available. I will not share your email so no worries. One day is sufficient to visit, unless you will do a lot of hiking into the backcountry. The drive into and out of the park can be long, take that into account in your plans. No gas in the park, make sure you fuel up before you go. Drive to the end of highway 180 first and work your way back to beat the crowds during peak season. Visalia and Fresno are good gateway cities with lots of services. If staying in Visalia, take highway 245 for more direct access to Kings Canyon, bypassing the slower Generals Highway. However, if you have not driven Generals Highway, it’s a must. Kings Canyon Scenic Byway, the highlight of the park, is closed from October to very late April due to snow. Plan accordingly.